Nine minority students entering Texas medical schools this fall each will receive a $5,000 scholarship from the Texas Medical Association (TMA). Students were recognized at TexMed, the association’s annual conference, in Austin for their academic achievement, commitment to community service, and deep desire to care for Texas’ increasingly diverse population. The TMA Educational Scholarship, Loan, and Awards Committee chose winners from a competitive field of promising future physicians. 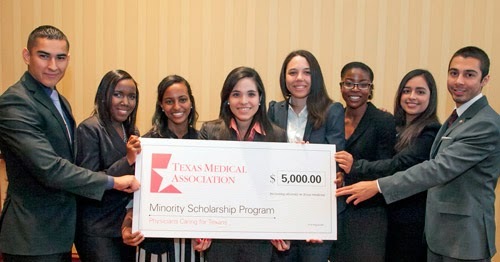 TMA created the Minority Scholarship Program to help diversify the physician workforce to fulfill the needs of Texas’ diverse population. The scholarship encourages minority students to enter medicine by lightening their medical school financial burden. Since 1999, TMA has awarded 101 scholarships totaling $505,000 thanks to generous gifts from donors to the TMA Foundation. Lillian Ene of Rockwall graduated from the University of North Carolina, Wilmington. She will attend Texas Tech University Health Sciences Center-Lubbock to become a pediatrician or emergency physician in rural Texas. Jennifer Espinales of Harlingen graduated from The University of Texas at Brownsville and will attend The University of Texas Medical Branch at Galveston. She plans to become an internal medicine physician. Hillary Evans of Buda is a graduate of Saint Edward’s University in Austin. She will attend The University of Texas Southwestern Medical Center in Dallas to become an internal medicine physician. Kimberly Farias of Waco graduated from The University of Texas at San Antonio and will attend the University of North Texas Health Science Center at Fort Worth. She plans to become a pediatrician. Samuel Garcia of Horizon City graduated from The University of Texas at El Paso and will attend Texas Tech University Health Sciences Center Paul L. Foster School of Medicine in El Paso. He plans to become a cardiologist. Peris June Nganga of Irving graduated from The University of Texas at Dallas and will attend The University of Texas Health Science Center at San Antonio to become a primary care physician. Efrain Rodriguez of Mission graduated from The University of Texas Pan American in Edinburg and will attend The University of Texas Health Science Center at Houston. He will study to become a family physician. Ruth Woldemichael of Amarillo graduated from Rice University in Houston and will attend Texas A&M Health Science Center in College Station. She plans to specialize in family or internal medicine. The ninth scholarship recipient, who will attend Baylor College of Medicine, will be determined following TexMed. The TMA Minority Scholarship program is supported by the TMA Foundation, the philanthropic arm of TMA, thanks to generous major supporters and gifts from physicians and their families. It's amazing information here for the students.